A magnet for Turks as well as visitors from across Europe and the rest of the world, Marmaris has a magnificent marina and harbour. Its popularity means this bustling resort is also blessed with a fine selection of places in which to eat out. The Bazaar, in the city centre, is packed with little cafes, diners and takeaway food stands where you can join the locals to sample typical Turkish fare, such as kebabs and meza. Netsel Marina is where you’ll find many of the resort’s top-class eateries. 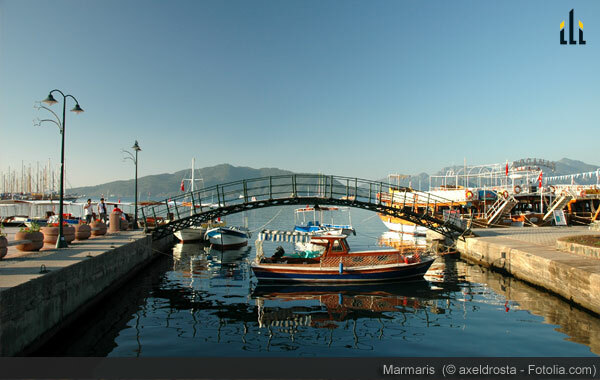 No matter your budget or what type of cuisine you’re looking for, you’ll be spoiled for choice in Marmaris. Grab a table with a stunning sea view at La Fortune, in the Netsel Marina Shopping Centre. This well established restaurant specialises in serving the freshest of seafood and steaks. Its romantic setting and quality menu makes it a classy choice for dining out. Another long-standing Marmaris favourite is Dede, by the harbour, which is renowned for its enormous menu and quality cuisine, as well as the superb sea views. Check out the swordfish skewers or try the pasha basket with chicken or steak served in a potato basket. Also in the marina is Nil Restaurant, a venue to which many visitors return again and again because of the fine food and excellent service. Its seafood is particularly good and, like many Marmaris restaurants, is also well known for its excellent steaks. Seafood is the speciality at the Drunken Crab, on Bar Street near the waterfront, with connoisseurs particularly keen on the paella. The restaurant is small so it’s probably best to book a table in advance where possible. O’Yes, at Netsel Marina, is famous locally for its steak and pasta dishes. Try its renowned fillet of beef served on an oaken plank in the sauce of your choice. And if you still have room after that, the banana split is the dessert to die for. Expect to pay a little bit more when eating at Uno Momento but this hugely popular Italian restaurant is obviously worth every lira considering how busy both its branches are. Pizza and pasta naturally feature strongly on the menu alongside excellent steaks and chicken. If, like many fans of Indian cuisine, you can’t possibly go a week or two without having a curry, head for the Taj Mahal, which offers a broad selection of authentic curries and even provides tempting little appetisers as you wait to be seated. Make sure you’ve got your appetite with you at Nathalie’s Steakhouses where the portions are legendarily massive and many Marmaris visitors consider the steaks here to be the best in the resort. Near the main beach is Meza, a restaurant serving traditional, small Turkish plates of food. Similar to Spanish tapas, meza can mean anything from deep fried calamari to savoury pastries – ideal for those who love to share or simply want to try as much as possible at a meal. You’ll be rubbing shoulders with the locals at Sofra where this genuine Turkish restaurant’s menu includes a local favourite – lamb stew with rice and beans, served with home-made crusty bread – and, of course, kebabs of every kind. Head for the Bazaar where there are lots of eateries to tempt you, including Liman Restaurant. Specialising in meza and seafood and meat stews, the staff here will also rise to any challenge so if there’s something you fancy that’s not on the menu, just ask! Those with a sweet tooth will love the traditional Turkish pastries available in eateries across Marmaris but an experience not to be missed is coffee and a dessert is So Sweet Dessert where puddings are a thing of beauty. Cheesecakes, soufflés and tiramisu will have your taste buds tingling, all washed down with a cup of the flavoursome local coffee and teas. 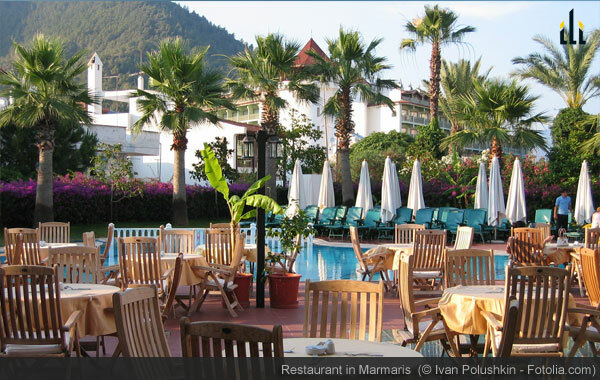 With only around 28,000 permanent residents, Marmaris’s population swells to around 250,000 during the summer months, and its restaurant and café scene really takes off during the busiest time of year, giving holidaymakers a terrific choice of places to eat in. If you’re now inspired to sample some of these dining experiences, why not enjoy the sun shine and other attractions Marmaris has to offer.